The Tameside App began life in 2014 as part of the Council’s drive in increase levels of recycling. It was simply designed to remind residents the night before their weekly waste collection date which colour of bin needed to be presented. With ten’s of thousands of downloads in the first 18 months the App was being used by more than 1 in 6 households in Tameside. Since then the App has been further developed to support “in-cab” functionality. iPAD’s have been installed across the refuse fleet. Issues such as “pull out and returns” are flagged to the driver and residents can now report missed bins directly to driver on that round so they can return if practical and also provide notifications back to the resident. The App has now been extended to include reporting Street Scene issues such as litter, grot spots & graffiti. Each report is GPS positioned & photo’s can be uploaded. A map provides details of all reports across Tameside & once resolved notifications & “after photos” to show the issue has been cleared are sent. This functionality is being expanded to include pot holes and Street Light issues during Autumn 18. A Members App version is also being launched which provides ward based reports to Councillors. Over 20,000 downloads of the App and over 1 million transactions per year. System designed to allow residents to interact direct with refuse crew or Street Scene Team regarding issues reported by the App. No need for back office intervention. Simple, intuitive system allowing people to report issues quickly, simply and at their convenience. All requests and reports receive “feedback” notifications so that residents are clear about what’s happening, what they need to do or when the things are resolved. 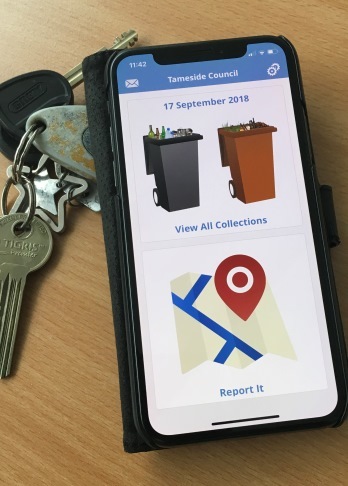 Since the latest version of the Tameside App was launched in April this year it has quickly become the most popular way for residents to report street scene issue as well as keep up to date with the which bin is being collected on what day. The Members App will ensure Councillors have a real-time view of issues in their ward, with the ability for them to “watch” certain reports and interact directly with the back-office or front line staff on any issue.